As the Internet has become more mature, rich applications featuring responsive user interfaces and interactive capabilities have become increasingly popular. The capabilities represent a way to make programs easier to use and more functional, thus enhancing the user experience. Developers have used a variety of applications from companies such as Macromedia, Microsoft, and Sun Microsystems to add these capabilities in the past, as discussed in the “Developing Large-Scale Rich Web Applications” sidebar. However, Web applications have generally exhibited problems such as slow performance and limited interactivity, particularly when compared to typical desktop applications, noted Nate Root, research director for Forrester Research, a market analysis firm. When companies began working with the technology several years ago, before the approach even had the name Ajax, they used it for smaller, less important applications. However, as the component technologies have improved, Google and a number of other companies have started using Ajax for more important enterprise applications. In addition to its map site, Google has worked with Ajax to build applications such as Gmail and Google Groups, a community and discussion service, said Bret Taylor, Google Maps product manager. Flickr uses Ajax in some parts of its Web site, on which users post and share photographs. For example, Ajax enables the site to let users add and view photo annotations. Expedia has produced features such as pop-up calendars on its travel site via Ajax. All major browsers now support the technology. Thus, Ajax could pose a threat to Microsoft, Macromedia, and Sun. However, while some companies may decide Ajax is particularly useful for certain kinds of applications, industry observers say it won’t be suitable for all types. And in some cases, companies may use Ajax to complement other Web-application approaches. Meanwhile, Ajax still faces several technical challenges, such as usage complexity and security. The technology describes HTML extensions that designers can use to develop dynamic Web pages that are more animated than those using previous HTML versions. For example, when a cursor passes over a DHTML page, a color might change or text might get bigger. Also, a user could drag and drop images to different places. Ajax uses XML to encode data for transfer between a server and a browser or client application. The W3C started work on XML in 1996 to enable cross-platform data interoperability over the Internet. The consortium approved the standard’s first version in 1998. XML is a markup meta- language that can define a set of languages for use with structured data in online documents. Any organization can develop an XML-based language with its own set of markup tags. 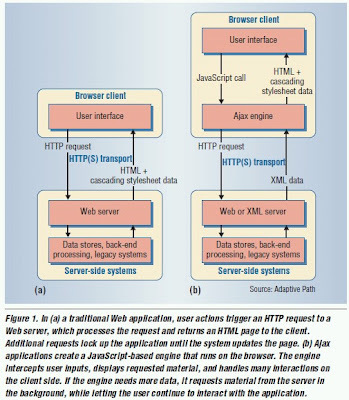 Various browsers—including recent versions of Internet Explorer, Mozilla’s Firefox, Netscape, and Apple Computer’s Safari—work with XMLHttp-Request. The engine intercepts user inputs and handles many interactions, such as simple data validation, on the client side, Root said. If the engine needs more data, it requests the material from the server in the background without locking up the user interface. The engine thus lets users interact with an application independently of server communication, reducing server response wait times.